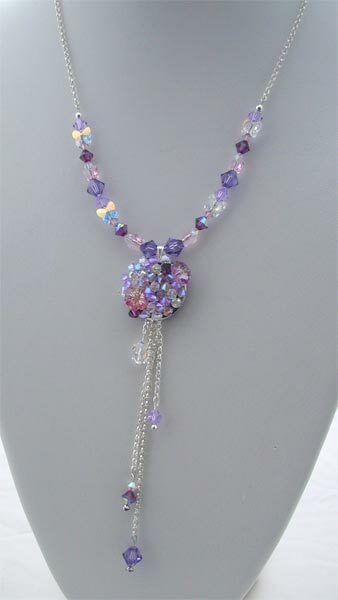 Florals, romance and femininity are dominating the catwalk this season.So, inspired by these key trends I have designed and made this near 20" necklace consisting of sterling silver chain and a combination of swarovski bicone beads in pinks and purples, even including AB swarovski butterfly stones which reflect surrounding colours, for a summertime feel. Hanging form the main chain is a 1" pendant encrusted with more swarovski stones.To pick up on this seasons floral trend I have added swarovski flower beads in shades of rose which have then been surrounded by more multi toned coated beads which give the necklace a modern iridescent feel. The pendant is completed by a 4" drop of more sterling silver chain , each chain has a combination of beads on the ends held on by swarovski headpins which each have a diamante stone in complimentary colours. This necklace is the ultimate in feminine and would be perfect for a wedding or a special evening out.